Ahhhh, fall is here! One of my favorite seasons. Though I am so ready to bust out my fall outfits, this Texas weather isn't quite ready for it just yet! We are still in the 90's and probably will be for a while! So until then, I'll be anxiously waiting for that first cool front to come through and sipping on all the pumpkin spice coffee I can get my hands on! 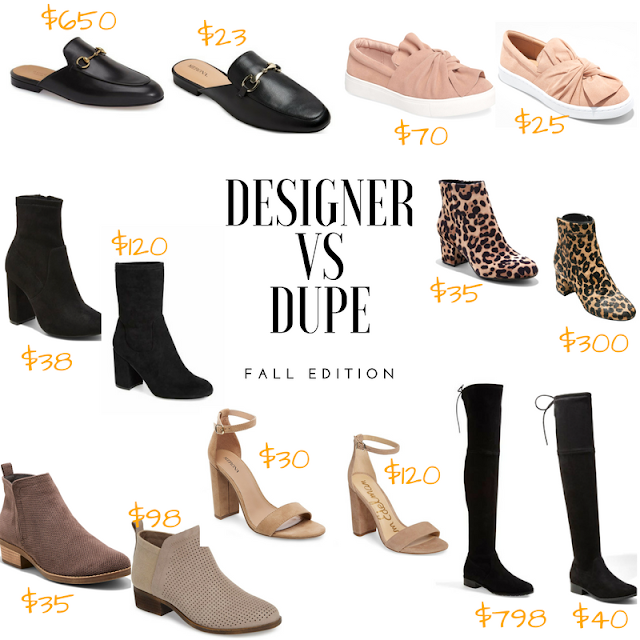 I wanted to do another designer vs. dupe post highlighting all types of fall shoes! From booties, to mules and over the knee boots, I found a ton of dupes that will save you hundreds! And of course, my favorite place to find designer shoe dupes is...you guessed it... Target! This weekend we are having my daughter's 4th birthday party! We were supposed to have weather in the low 80's but now it looks like it will be in the upper 80's. Can't complain though, last year it POURED on her birthday, and the year before that, and the year before that! I was hesitant about having another outside party but it looks like we will finally have sunny skies! Hope yall have a great weekend!